State the Heisenberg uncertainty principle. Estimate the mass of a pion. Particle physics as we know it today began with the ideas of Hideki Yukawa in 1935. Physicists had long been concerned with how forces are transmitted, finding the concept of fields, such as electric and magnetic fields to be very useful. A field surrounds an object and carries the force exerted by the object through space. Yukawa was interested in the strong nuclear force in particular and found an ingenious way to explain its short range. His idea is a blend of particles, forces, relativity, and quantum mechanics that is applicable to all forces. Yukawa proposed that force is transmitted by the exchange of particles (called carrier particles). The field consists of these carrier particles. The strong nuclear force is transmitted between a proton and neutron by the creation and exchange of a pion. The pion is created through a temporary violation of conservation of mass-energy and travels from the proton to the neutron and is recaptured. It is not directly observable and is called a virtual particle. Note that the proton and neutron change identity in the process. The range of the force is limited by the fact that the pion can only exist for the short time allowed by the Heisenberg uncertainty principle. Yukawa used the finite range of the strong nuclear force to estimate the mass of the pion; the shorter the range, the larger the mass of the carrier particle. Taking the range of the strong nuclear force to be about 1 fermi ( ), calculate the approximate mass of the pion carrying the force, assuming it moves at nearly the speed of light. The calculation is approximate because of the assumptions made about the range of the force and the speed of the pion, but also because a more accurate calculation would require the sophisticated mathematics of quantum mechanics. Here, we use the Heisenberg uncertainty principle in the simple form stated above, as developed in Probability: The Heisenberg Uncertainty Principle. First, we must calculate the time that the pion exists, given that the distance it travels at nearly the speed of light is about 1 fermi. Then, the Heisenberg uncertainty principle can be solved for the energy , and from that the mass of the pion can be determined. We will use the units of for mass, which are convenient since we are often considering converting mass to energy and vice versa. This is about 200 times the mass of an electron and about one-tenth the mass of a nucleon. No such particles were known at the time Yukawa made his bold proposal. Yukawa’s proposal of particle exchange as the method of force transfer is intriguing. But how can we verify his proposal if we cannot observe the virtual pion directly? If sufficient energy is in a nucleus, it would be possible to free the pion—that is, to create its mass from external energy input. This can be accomplished by collisions of energetic particles with nuclei, but energies greater than 100 MeV are required to conserve both energy and momentum. In 1947, pions were observed in cosmic-ray experiments, which were designed to supply a small flux of high-energy protons that may collide with nuclei. Soon afterward, accelerators of sufficient energy were creating pions in the laboratory under controlled conditions. Three pions were discovered, two with charge and one neutral, and given the symbols , respectively. The masses of and are identical at , whereas has a mass of . These masses are close to the predicted value of and, since they are intermediate between electron and nucleon masses, the particles are given the name meson (now an entire class of particles, as we shall see in Particles, Patterns, and Conservation Laws). The pions, or -mesons as they are also called, have masses close to those predicted and feel the strong nuclear force. Another previously unknown particle, now called the muon, was discovered during cosmic-ray experiments in 1936 (one of its discoverers, Seth Neddermeyer, also originated the idea of implosion for plutonium bombs). Since the mass of a muon is around , at first it was thought to be the particle predicted by Yukawa. But it was soon realized that muons do not feel the strong nuclear force and could not be Yukawa’s particle. Their role was unknown, causing the respected physicist I. I. Rabi to comment, “Who ordered that?” This remains a valid question today. We have discovered hundreds of subatomic particles; the roles of some are only partially understood. But there are various patterns and relations to forces that have led to profound insights into nature’s secrets. 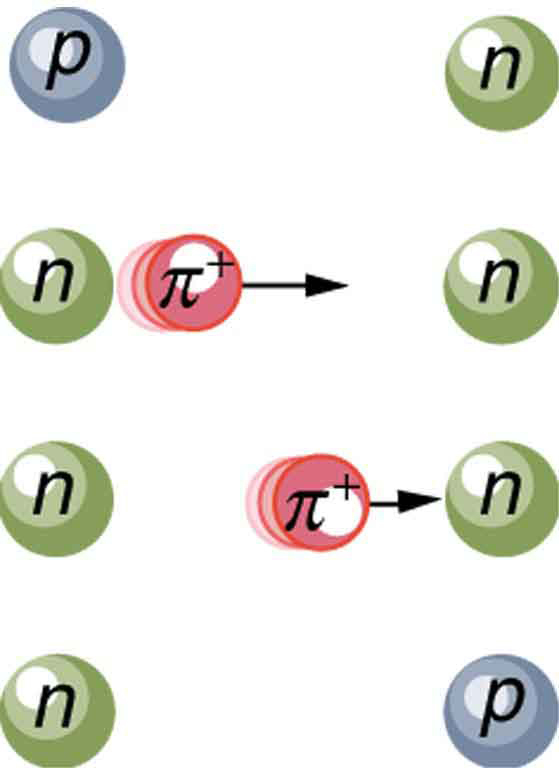 Yukawa’s idea of virtual particle exchange as the carrier of forces is crucial, with virtual particles being formed in temporary violation of the conservation of mass-energy as allowed by the Heisenberg uncertainty principle. A virtual particle having an approximate mass of may be associated with the unification of the strong and electroweak forces. For what length of time could this virtual particle exist (in temporary violation of the conservation of mass-energy as allowed by the Heisenberg uncertainty principle)? Calculate the mass in of a virtual carrier particle that has a range limited to m by the Heisenberg uncertainty principle. Such a particle might be involved in the unification of the strong and electroweak forces. Another component of the strong nuclear force is transmitted by the exchange of virtual K-mesons. Taking K-mesons to have an average mass of , what is the approximate range of this component of the strong force? The Yukawa Particle and the Heisenberg Uncertainty Principle Revisited by OpenStaxCollege is licensed under a Creative Commons Attribution 4.0 International License, except where otherwise noted.